“I’m incredibly honored to have the endorsement of the California Democratic Party in the U.S. Senate race, and I’m so proud of the support our campaign has received from every corner of our state,” said California Attorney General Kamala Harris, who overwhelmingly won the California Democratic Party’s endorsement this past weekend at the California Democratic Convention. Harris is the first statewide candidate in a competitive primary to win the party’s endorsement since 2010. She earned 78 percent of the vote, well over the 60 percent threshold needed to win the party’s endorsement. Throughout the three day convention, Harris met with delegates in the hallways of the San Jose Convention Center and in caucus meetings, speaking about topics ranging from labor to education to the environment and women’s issues. During the African American caucus, she was presented with the Good Works Award for her service to California as Attorney General. On Saturday, she spoke to over 3,000 enthusiastic Convention attendees, many who waved Kamala Harris for Senate signs. During her speech she talked about the “Politics of Poison” that have permeated the race for the Republican nomination, and called on Democrats to stand together and accept the challenge President Obama reminded us of: the challenge to be a more perfect union. Harris became the 32nd Attorney General of California in 2011. Before that, she served in Alameda County, California as deputy district attorney for eight years, beginning in 1990. In 1998, upon finishing her term as D.A., Harris took the lead as managing attorney for the Career Criminal Unit in San Francisco’s D.A. office. 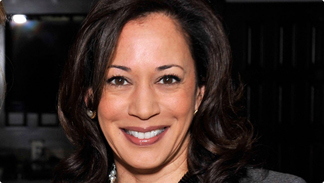 Harris was born in Oakland, raised by a doctor mother and economics professor dad. Her parents split up when she was young, leaving her and her sister primarily in the care of their mother. “My parents were both graduate students at the University of California at Berkeley,” Harris recalled via a written bio on her campaign website. Harris credits civil rights era attorneys like Thurgood Marshall and Charles Hamilton Houston as her inspiration. Their work, she said, was an example of how to fight effectively “for the voiceless and for justice”. As a Northern California attorney, Harris set out to take a different approach toward crime. She repeatedly “challenged the false choice that we must either be “soft” or “tough” on crime, and set forth a new vision for public safety that focuses on prevention, combating recidivism, and addressing the root causes of crime, rather than just treating its symptoms,” she wrote. “This endorsement is a big milestone on a very long road to the general election in November,” she said during her convention speech. “I look forward to visiting more communities across the state to speak with Californians about how we can work together to repair the ladder of opportunity that is broken for far too many families. “We need to ensure that every child receives a high quality education; every student attends college without being intimidated by the cost; and every Californian finds work that allows them to make ends meet. “Fabulous news — even though, given her credentials, I’m not surprised,” said Sentinel Publisher Danny Bakewell Sr.